Ask a seasoned recruiter to list the benefits of hiring freelancers and she’ll likely write you an essay. In this post, I’ve covered the top 6 of those benefits and backed them up with facts. Ready to find out why freelance workers are the future? Upworks’ 2017 Future Workforce report found that hiring freelancers is becoming an ever more popular way of accomplishing more in the workplace. Many companies regularly use freelancers to help them handle an increased workload or a specialist project. The Upwork report showed that 48% of companies utilise at least some form of flexible workforce, with 55% of those who used freelancers in 2016 expecting to increase their use throughout 2017. “Businesses are scrambling to adapt and keep up with the rapid pace of change in our world. Being able to manage a remote team of diverse talent is becoming one of the most sought-after skills that companies look for in a leader. With the flexibility freelancers offer, forward-thinking leaders have the right people on hand when they need them, enabling them to adapt to changes and stay ahead of the competition. Consider your requirements when you’re searching for an employee. You’ll usually have many tasks and responsibilities in mind for them, expecting them to juggle a multitude of things whilst also being able to adapt quickly to changes in your business. In comparison, freelancers are generally hired to handle one specific project. They do the same (or similar tasks) for several different companies, enabling them to become a practised expert at few tasks. A successful candidate for a full-time hire, therefore, might have a broader but more diluted skill set than a freelancer, who will usually be a specialist in one or two areas. Because of this, your search for a freelancer can focus much more on the particular skill set they’ll need to complete the project, rather than how they might balance multiple tasks and adapt over time. A recent Vodafone survey found that 83% of companies saw an increase in productivity after introducing flexible working. Also of note is that an IPSE study reported 84% of freelancers feel satisfied by working on a freelance basis. Compared to the results of a recent CIPD report on employee engagement – which said that only 29% of employees often feel cheerful at work – these results are very favourable. When you consider the widely accepted view that a happy and engaged employee is a productive one, it stands to reason that one of the key benefits of hiring freelancers is that they may well be more productive than an employee. The same IPSE study found that 64% of freelancers intend to continue working that way for the foreseeable future. Only 3% want to switch back to employment as soon as possible. Even 70% of freelancers who didn’t choose to freelance (i.e. they lost their jobs and/or had no other option) are still satisfied with working this way. Because most freelancers choose to work the way they do and wish to continue doing it for as long as possible, it’s in their best interests to produce quality work that will secure them repeat business and referrals. Remember, just like you, freelancers are running their own business. The better their service, the more likely they are to succeed. One of the most obvious benefits of hiring freelancers is the fact that you’re not paying them consistently. When the workload is lower or you have a full team of employees with no one on maternity or sick leave, there’s no pressure to continue sending work in your freelancer’s direction. In addition to this, there’s no rule requiring you to contribute to a pension fund, pay maternity or provide additional benefits (such as health care insurance, childcare vouchers, travel costs or gym memberships). Your financial risks reduce when you hire a freelancer over a traditional employee. If a freelancer is unable to work due to ill health, family emergency or any other circumstance, you have no responsibility to pay them for their time off. According to the Office for National Statistics (ONS), the UK lost an estimated 137.3 million working days due to sickness or injury in 2016, costing the economy £18 billion. That’s an average of over £520 per employee each year. So, whilst a freelancer’s hourly rate is likely to be higher than an in-house employee’s, it’s important that you take all costs into account. Weigh it up and you’ll often find the freelancer comes out cheaper. With the magic of today’s technology, there really are no limits. There are countless apps, devices and pieces of software that make remote working not only doable but sometimes better than working side by side. Why limit yourself to a small pool of local talent when you’ve got the whole world to choose from? Upworks’ report found that location doesn’t matter. When asked what’s important to a new hire’s success, only 9% of hiring managers thought that being able to have them in the same office was crucial. 75% said the new hire’s ability to perform the necessary skills was the key indicator. 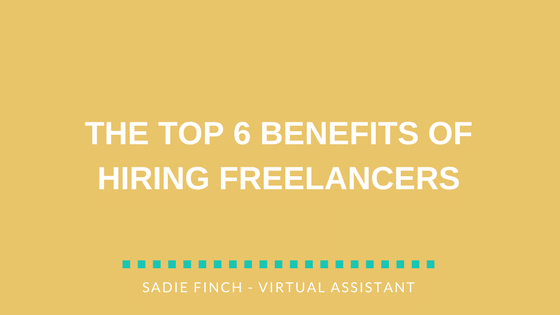 If you’re ready to dive right in and hire your first freelancer, a virtual assistant who provides a wide variety of services could be the right option for you. I’d love to give you more time to focus on moving your business forward. Let me take on the administrative tasks that clog up your day so that you can focus on the stuff that really matters. Get in touch with me now for a complimentary one-hour consultation.